How Do You Figure Out What Size a Model Should Be if You Have a Scale? Before tall sky scrapers are build, a scale model of the building is made, but how does the architect know what size the model should be? Follow along with this tutorial to find out! In math, the term scale is used to represent the relationship between a measurement on a model and the corresponding measurement on the actual object. Without scales, maps and blueprints would be pretty useless. 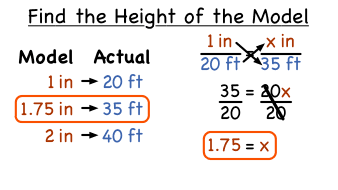 Check out this tutorial and learn about scale factor! Maps help us get from one place to another. In this tutorial, you'll learn how to use a map to find an actual distance.